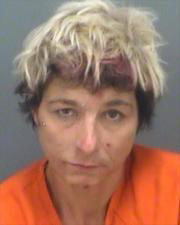 OCTOBER 15--In an apparent bid to destroy evidence, a female drug suspect chewed and swallowed a glass crack pipe, according to Florida cops who arrested the woman on narcotics possession and tampering charges. Hutton then began “rummaging” through her bag, which allowed a cop to spot “a small glass pipe” with Brillo and “burnt residue” inside. The officer then sought to grab Hutton’s wrists so that he could handcuff her. “While I was doing this, she placed the pipe in her mouth and refused to open it,” Officer Robert Drumm reported. Hutton, seen above, then began “chewing and attempting to swallow” the crack pipe in the face of Drumm’s demands to spit out the drug paraphernalia. “Afterward, once she was placed in custody she made a big swallow,” added Drumm. When Hutton finally opened her mouth, the patrolman observed that she was bleeding from a cut on the roof of her mouth. And the crack pipe had disappeared. Hutton was booked into the county jail for tampering with physical evidence, a felony, for consuming the crack pipe. She was also charged with resisting arrest, a misdemeanor, and felony narcotics possession (her purse contained methadone pills for which she did not have a prescription).